Coorg, a popular tourist destination is known for its vast expanse of coffee plantations and scenic beauty. Travelers can look forward to spending a relaxed vacation exploring and taking in the beauty of Coorg. Misty hills, lush forests and breath-taking waterfalls are some of the few things Coorg has to offer. However, another place of interest that shouldn’t be missed by any tourists are the historical monasteries that exudes rich Tibetan culture. The formation of mini Tibet in Coorg cropped up when Tibetans were forced to leave their motherland after the Chinese took over. As a result, they came down to Coorg as refugees to seek asylum. The serene atmosphere and stunning architecture of the monasteries is sure to leave you awestruck. The vision of Buddhist monks doing religious rituals and offering prayers is a captivating sight to behold. 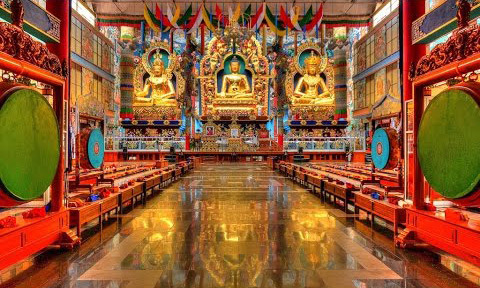 One such stunning Buddhist monastery situated near the twin town of kushalnagar in Bylakuppe is the Golden Temple or Namdroling Monastery. After Dharamshala, Bylakuppe is known to be the second largest Tibetans settlement in India. 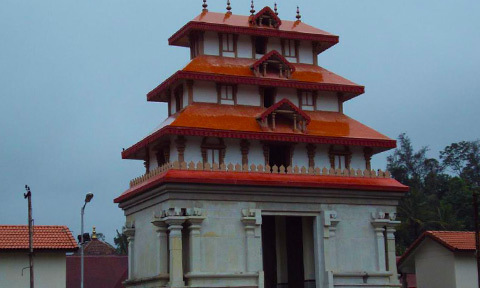 This magnificent Monastery is a popular tourist attraction in Coorg. 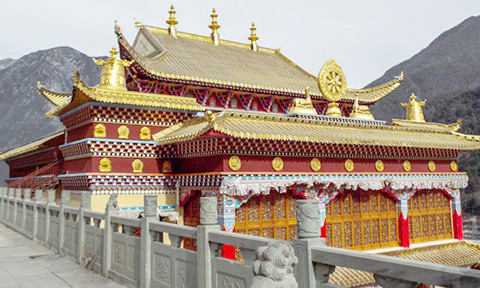 This Golden Temple was established in 1963 and is now recognized as the largest teaching center of Nyingmapa, a lineage of Tibetan Buddhism in the world. It is also home to over 5000 monks and nuns who belong to the sangha community. The massive complex of the Golden Temple complex boasts the splendid gilded images of Guru Padmasambhava (also known as Guru Rinpoche), Buddha Sakyamuni and Amitayus. The temple by itself emanates a glorious aura with impressive visuals. Right from the entrance the doors welcome you with a grand appearance leading to more impressive and ornate structures and colourful murals depicting gods and demons from Tibetan Buddhist mythology. 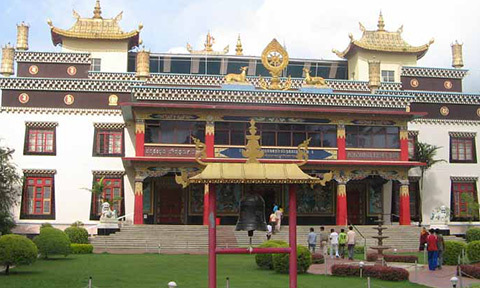 This monastery is home to large number of young Tibetans seeking enlightenment and education and draws large number of tourists from all over India and abroad. The festival of Tibetan New Year (LOSAR) is celebrated with much fervour at the monastery making it one of the best times to visit. 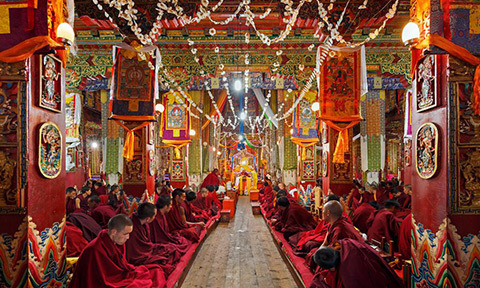 To celebrate the occasion, the monastery hosts traditional colourful lama dances and exhibits, a Tibetan silk painting called Thangkas with embroidery depicting Buddhist deity. Other smaller monasteries in and around Coorg also have a charming allure. A monastery that is modelled after the original Sera University called Sera Monastery is situated nearby and belongs to the Gelugpa sect of Buddhism. Other beautiful smaller monasteries around the area are also worth a visit such as; the Sakya Monastery and the Tashi Lhunpo Monastery. Sakya Monastery displays double story structure and is on the way to the main monastery. One of the four great monasteries of central Tibet, Tashi Lhunpo Monastery is the original seat of the Panchen Lama. Your peaceful and tranquil vacation at Coorg will be completed with a visit to these local monasteries. To enhance you holiday experience and make it more enjoyable, Sixth Element is the perfect choice for a comfortable stay. The beautiful cottages built around the serene and calm landscape is sure to offer you maximum comfort and relaxation. Sixth element is the right partner for you to cherish your time at this little Tibet.